Bond Economics: Has The Bond Market Been All Wrong on Inflation? Has The Bond Market Been All Wrong on Inflation? Daniel Kruger had a recent article at Bloomberg "Bond Markets Got It All Wrong When It Comes to Biggest Foe." Although it is entertaining to point out market inefficiencies, this particular analysis is not particularly fair. And in particular, the short life of the TIPS market (U.S. inflation-linked bonds) means that we cannot say too much about the market's track record. The belief that inflation is the biggest enemy of bond investors is a cliché that is beloved by newspaper editors and economics professors. It is also wrong -- losing money is the biggest enemy of bond investors. It may have been true when widows and orphans have been the price setter in the bond market, but we have not had such a market environment for a very long time (if it ever was the case). A popular way of explaining the incorrect belief is to say that bond investors "lose money" if the rate of inflation is greater than the bond yield. Funnily enough, it is only bond investors that "lose money" due to inflation, and not equity investors. But this does not take into account how bond pricing is set. If I (a Canadian) buy U.S. Treasurys, I could care less whether American citizens have to pay more for ground beef than last year. Furthermore, if I am levered 10:1, the running yield on a bond tells us almost nothing about the nominal rate of return I will achieve. One can attempt to salvage this theory by saying that policy rate changes determine bond yields, and the central bank sets the policy rate based on inflation expectations. Unfortunately, this can have very little to do with realised inflation. As the last couple of decades attest, interest rates can swing up and down with almost no significant change in realised inflation. Since a credible central bank is supposed to stabilise inflation expectations (which is the consensus explanation of post-1990 behaviour), even inflation expectations will not move, just the real rate. Has The TIPS Market Been Steadily Wrong? On short-term horizons (one year, say), headline inflation is largely by the gyrations of oil prices. Short-term inflation breakevens (primer here) just tell us what TIPS traders think oil is going to do in the near run. They are probably just as successful as any other commodity forecaster. We need to look at longer maturities in order to isolate what is happening in domestic inflation. 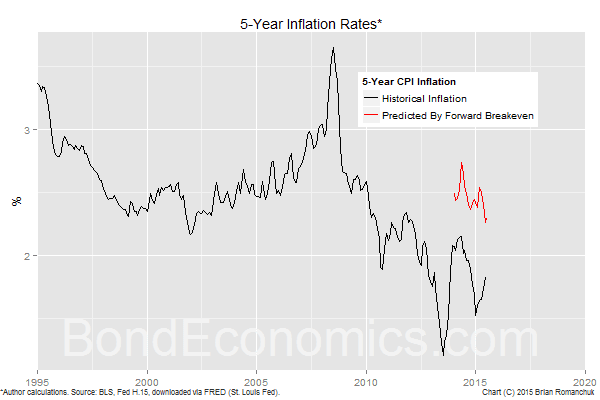 The best way of removing the effect of oil prices is to look at forward breakeven inflation rates, for example, the 5-year breakeven starting 5 years forward which is pictured above. Since there is no good reason to predict an oil price spike starting exactly 5 years from now, the forward breakeven represents a long-term average value. sell a 5-year bond (with the same notional). In order to see whether a 5-year forward rate is too high or low relative to realised inflation requires waiting 10 years (when the long leg of the package matures). Unfortunately, the TIPS market has not been around for too long (first issuance in 1997). Compounding the problem is the fact that Fed H.15 series that I use are only available starting in 2004, and so I have almost no history of the breakeven market's forecasting prowess. The black line shows the 5-year annualised inflation rate (all items, or headline) for the United States. For example, the latest figure is for June 2015, where the annualised inflation rate is about 1.8%. That is, for the period June 2010 - June 2015. Since this covers the post-crisis period, it is not surprisingly below the averages seen earlier. Meanwhile, the predicted value -- which equals the 5-year, 5-year breakeven from June 2005 -- was above 2%. It is hardly surprising that the bond market did not predict the weakness of the post-2010 period in 2005. If we had a longer run of history, we could see how well the breakeven market's predictions are on average. (I did this style of analysis for nominal Treasurys in this earlier article on the term premium.) But since the earliest possible start date for analysis would be for inflation averages ending in 2007, and so we are still stuck at mainly looking at post-crisis behaviour. 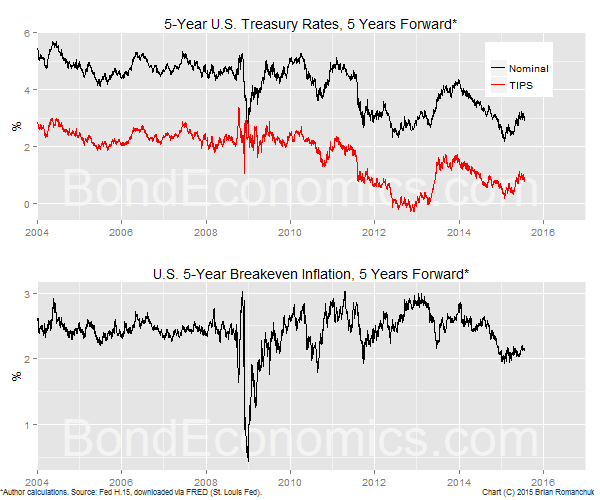 Nevertheless, the current levels of forward inflation breakevens do not appear particularly attractive. to be over-predicting future inflation. [UPDATE: Since I was not thinking about a trade recommendation, my initial wording was backwards from what I meant to write.] Buying and holding bonds works out on average due to the term premium (which bond perma-bears keep rediscovering the hard way). But at the same time, bond bear markets do occur, so you cannot rely on a term premium to bail you out.